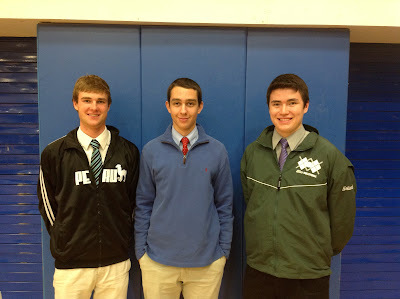 Pictured from left to right Seniors Josh Olsen, Tyler Ostrowski and Ethan Holland were recognized on Wednesday October 10th by the Shenendehowa Central School District for their academic achievement in carrying over a 95% cumulative average. In addition, Tyler Ostrowski was recognized for earning a 100% on the Spanish Regents examination. Congratulations Gentlemen!